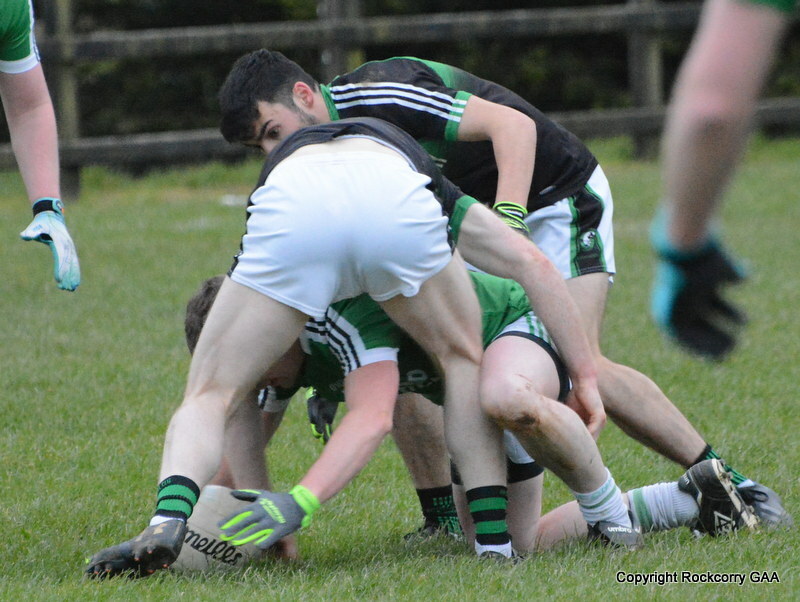 Our senior team travelled to Threemilehouse last Friday 2nd May to play Sean McDermott’s in the Monaghan Electrical intermediate football league and were forced to dig very deep in order to see off a determined and strong-minded Sean McDermott’s outfit. The lads were made to fight every step of the way in this highly absorbing but very entertaining encounter and when our backs were against the wall in the second half the entire team showed outstanding character and spirit and were hugely impressive in their five point triumph on a score-line Sean McDermott’s 2-5 Rockcorry 0-16. A full match report and a selection of action photographs can be viewed on our website www.rockcorrygaa.ie or visit our Facebook page. This Sunday 11th May they have a home game against Clones and throw-in time is 2pm. The club extends their best wishes and a speedy recovery to Martin Carroll who sustained a fractured jaw while playing against Sean McDermott’s last Friday night. Martin spent the whole night in Cavan Hospital and attended St. James Hospital for further consultation. Best wishes Martin and we hope you make a quick recovery and look forward to seeing you back in the green jersey as soon as possible. Our reserve team played Carrickmacross in the first round of the Platinum Tanks Reserve Football Championship last Sunday 4th May and after an absorbing and utterly compelling encounter nothing could separate the teams and will have to meet again to determine who will progress to the next round of the competition. No doubt, we will wonder how we let this game slip because with five minutes to play we were in a good healthy position, leading by three points, but we lacked the killer instinct to see off our opponents. Carrickmacross, on the other hand, finished the strongest and bagged a goal on the 27th minute and while we tried our best to grab a late winner the game ended all square, Rockcorry 1-9 Carricmacross 2-6. A full match report and a selection of action photographs can be viewed on our website www.rockcorrygaa.ie or visit our Facebook page. The 2014 County Open Night will take place in Cloghan next Friday 9th May starting at 8pm. Everyone young and old will have the opportunity to meet county players from the various different codes. They will get the chance to get players’ autographs and get their photos taken with them. Also present on the night will be a DJ and face painters. Wristbands, car stickers, autograph cards and mini flags will be given away. Please ensure you bring your own pens and pencils to get the autographs. Finally, the Monaghan Coaching and Games Staff will be organising various mini games that children can test themselves against County? Players. 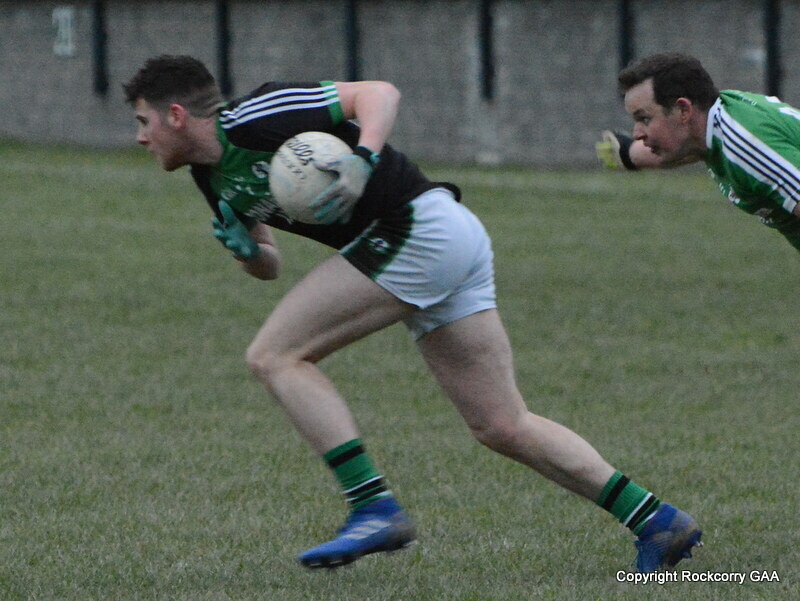 Their next game is against Eire Og which clashes with First Communion so the game will take place on the FRIDAY evening 9th May in Eire Og and throw-in time is 7pm. Our under 14 footballers got back to winning ways in the Gerry’s Prepared Veg Division 4 league competition with a stunning victory against Toome on Monday 5th May. 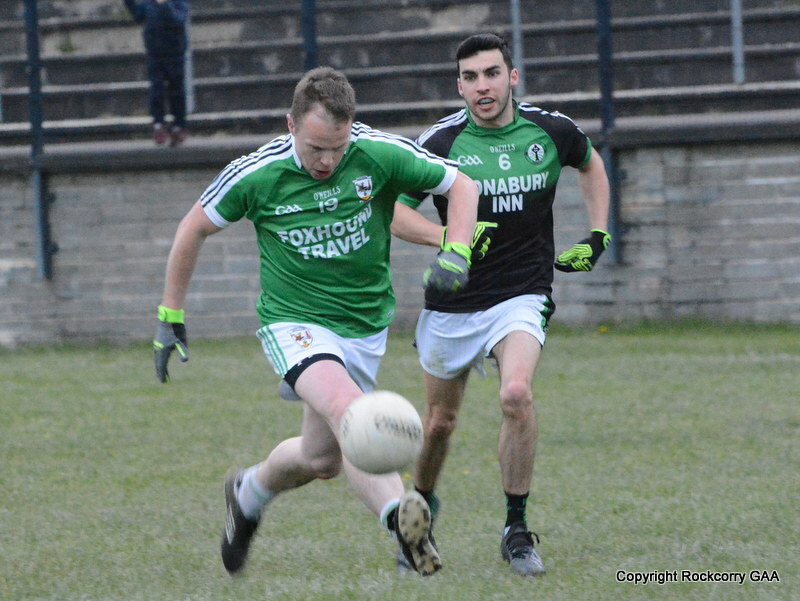 The game was played at Pairc Naomh Mhuire and the first quarter was evenly contested with both sides creating exciting football and at the end of the first period we trailed by 0-4 to 1-2. Our lads upped the intensity levels during the second period and worked extremely hard for each other and produced some lovely attacking football and were rewarded with some delightful scores to lead by 0-11 to 1-4 at the midway stage. There was a torrential shower of rain during the third quarter, which made conditions far from ideal but it did not deter both sides serving up an entertaining contest in the most trying of circumstances. The lads kept their foot on the gas and continued to put in a good effort and after forty five minutes we maintained a healthy advantage leading 2-13 to 2-6. The final quarter was end to end and at times heart stopping stuff as Toome applied a lot of early pressure and scored three goals. However, we withstood Toome’s mighty effort with an impressive 1-5 to secure the spoils on a final score-line Rockcorry 3-18 Toome 5-6. The next outing for the under 14 footballers is on Saturday 17th May when they play Tyholland. The game is fixed for Paic Naomh Mhuire and throw-in time is 12 noon. 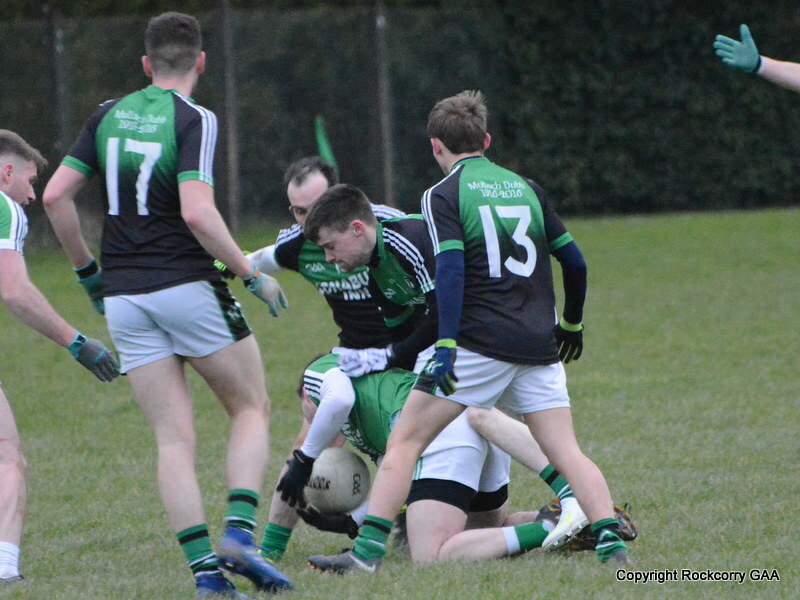 Our under 16 footballers played Cremartin last Thursday 1st May, in the Gerry’s Prepared Veg league campaign, and I’m afraid it was a case of having another bad day at the office as Cremartin totally dominated the encounter and secured a comfortable and comprehensive victory. On a cool summers evening, with conditions perfect, we clearly struggled to keep pace with Cremartin and their style of football and it was 0-4 to 4-8 at the half-way stage. 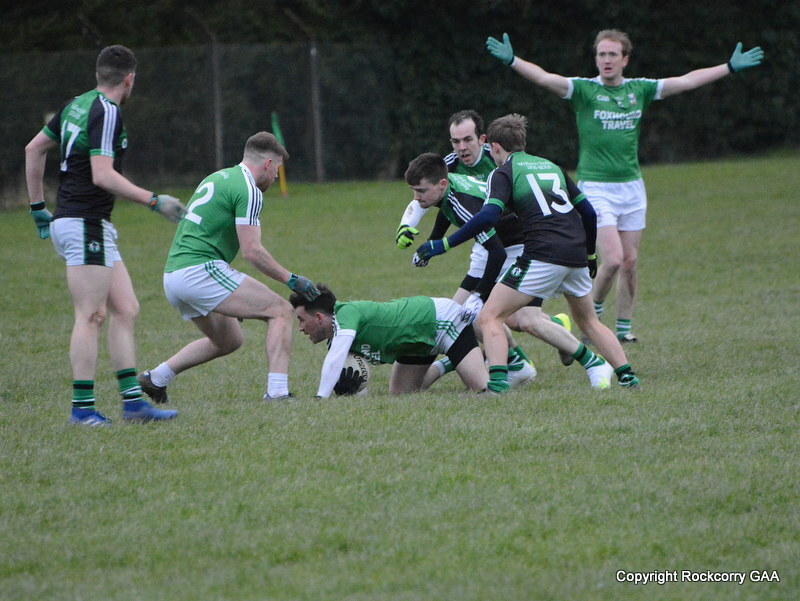 When play resumed, Cremartin continued to assert their authority on the game and tacked on another 3-5 after the break, while we only managed to add just two points, making the final score Rockcorry 0-6 to Cremartin 7-13. There is no dispute, Cremartin were superb, they were the better side in every facet of the game where everything went right for them and where nothing went right for us. It was a really tough day for everyone involved but to use the lyrics of the well-known Kanya West song “what doesn’t kill you can only make you stronger” and the lads must now regroup and look forward to the next game where they will have the opportunity to show their true talents and potential. Heads up lads and keep giving it 110%. Their next game is tonight, Thursday 8th May when they travel to Oram to play Emerald Sarsfields and throw-in time is 7.15pm. The under 10 footballers will get another chance to showcase their skills when they take part in a Go Games blitz on Saturday 17th May and on this occasion will not have far to travel because it will be held at Pairc Naomh Mhuire between 10am to 12 noon and other teams will be Drumhowan, Tyholland, Clones and Currin. The next blitz for the under 8 team will be on Saturday 24th May and it will also be held at Pairc Naomh Mhuire between 10am to 12 noon. On behalf of the club I want to extend our congratulations to Cathal Sheridan and his co-driver Evin Hughes who finished first at the recent Monaghan Stages Rally 2014. Cathal competed in the class 10 category with his distinctive Opel Corsa and well done to him on a wonderful achievement. The numbers drawn on Monday 5th May were 3, 11, 20 and 23. There was no jackpot winner of €8,000.00. The following won €15 each :- Sean & Leo, Rockcorry, Alex Brady, Rockcorry, John Connolly, Aghabog, Breda McFadden, Rockcorry, Mickey Wynne, Rockcorry, Una McGeough, Rockcorry, Aidan Sheridan, Rockcorry, Ciaran O’Hart, Rockcorry. Next week the jackpot will be €8,100.00 and the draw will take place in Fitzpatrick’s. Thank you for supporting our Top 4 lotto draw. On behalf of everyone at the Rockcorry GAA club I would like to extend our sincerest condolences to Ashley Morris and members of his family on the passing of his father Hugh Morris. May his gentle soul rest in peace.